People laughed when geologists started poking holes in the pine forest at the edges of the South Carolina Piedmont looking for gold. and when South Carolina suddenly became the only non-Western state among the 10 largest gold producers in the world. Gold mines in the Carolina Slate Belt - USGS.South Carolina had a number of lode gold mines along the Carolina Slate Belt. About 2 million ounces of gold have been produced in South Carolina since 1827. 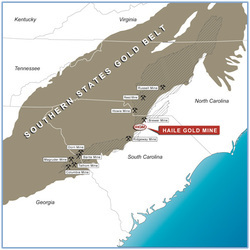 South Carolina was the scene of a modern-day gold rush between 1985 and 1996, with four major open-pit mines in production, plus widespread exploration. At the peak of activity, the Ridgeway (Fairfield County), Barite Hill (McCormick County), Brewer (Chesterfield County), and Haile (Lancaster County) were the principal mines in production. , the deposit was mined for associated sericite, which was used as a white filler. Gold is associated with silicic, kaolinitic, and pyritic alteration of greenschist-grade felsic metavolcanics.The mine was reopened as an open pit in the 1980s, and operated until 1992. Kinross Gold Corporation's reclamation of the Haile site was nominated for a US Bureau of Land Management "Hardrock Mineral Environmental Award. "The famed Haile, discovered in 1827, produced over 45,000 ounces of gold, plus considerable silver, between 1988 and 1990. The Haile Mine has produced over 350,000 ounces of gold since 1827. Haile is now owned by Remarco. Remarco has made new finds on the site that could yield huge amounts of gold. The Brewer mine operated from 1828 to 1995, and is now a federal Superfund site. Kennecott Minerals operated the Ridgeway open-pit gold mine from 1988 to 1999, and the land is now being reclaimed by Kennecott. Over 344,000 ounces of gold were recovered from the Ridgeway Mine in 1989-1990. Production of gold, a major component of South Carolina's nonfuel mineral sector, ceased when Kennecott Minerals's Ridgeway Mine closed down operations in 1999. Abbeville county lies in the gold-bearing belt extending from Dahlonega, Georgia, through the states of South Carolina, North Carolina, Virginia, and into Maryland. One of the richest of the "diggings" was the Dorn Gold Mine in the 1800's in Abbeville County. It was what was known as a "pocket mice," and after yielding $3,000,000 was abandoned, the pocket having been thoroughly picked, and for many years the mine has not been operated. While the mineral resources of the county are practically a virgin field, sufficient prospecting has been done to indicate vast potential wealth. Awaiting exploitation by even limited capital. Only a fraction of the gold present in the Piedmont region has been mined. gold bearing veins have been discorved on the site with great potential. The mine lies in the gold-bearing belt on a large tract of land yet to be explored. According to the history of the area and the large amount of gold found on the surface. The Candy Branch Mine owned and operated by the CONFEDERATE MINING Co. has the potential to become one of the states largest producers of gold.